This says it all. What amazing words. What do you want in this world? Do you want peace? Prosperity? Create it. Think it. Be it. Make it happen. Make it come to you. Today, I have a fun little pattern for you. I don’t know about you all, but I am S I C K of summer. I can’t wait for the fall, when I can get back to using my oven! I don’t mind the hot weather, but I really don’t like having to hibernate in the summer! UGH! Anyway, this is a pattern for a little cup cozy. It has cables. It can be a cup cozy, or a wrist cuff. So that’s what it is. It’s easy to make. I used Debbie Stoller’s Stitch Nation (Full O’ Sheep), and size 4.5 needles. Repeat rows 5-9 for cable stitch pattern until piece measure approxamitely 5.5 inches. I finished mine off with a garter stitch row or two, but you can do as you wish, and then bind off, leaving a long tail to sew up. Sew the seams together, and use as you wish! This can be a wrist cuff, or a cup cozy! Either way, knit this up when you are just plain sick of the summer heat and can’t wait to wear your hand knits! Wow. I have nothing to say. Well, that’s not true. Meditating has really saved my life quite a bit. How? Well, the truth is I was at one point a very sad person. I mean, I had a lot handed to me at a very young age. I’ve gone through things that some people don’t go through in a lifetime. Everyone goes through stuff. We all interpret it differently. Some children, when they are upset, they cry. Others yell and throw tantrums. It’s like adults. I’m more of a crybaby, myself. So I started meditating about 13 years ago, when I had miscarried. It was a hard time for me. I went through that alone. But meditation somehow helped me stay sane. That and my writing is really what saved me. Because of my solitude in life, I was forced to let out my sadness somehow. I let it out through my writing, and my art. It is in this time that I really feel that I started to become an artist. I was always creative. But my art came from this dark and dreary thing that happened to me so long ago. Everything happens for a reason. Bad things happen to good people. It’s life. But then we go through it, we turn to our faith in a higher power, we turn to our meditation and prayer…then years later we see…it happened, and out of it, came something beautiful. Today’s crafty endeavor, is a FREE knitting pattern! I’ve been working on this shawl for some time now, and just recently finished it! Yay for me. It’s another light, airy lace pattern, this time a variation on my golden cowl pattern. 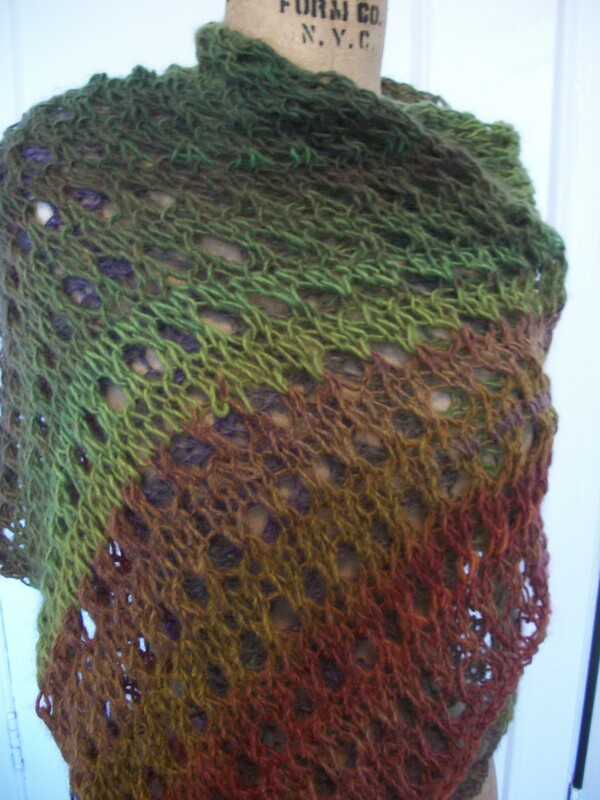 The nice thing about this shawl is that it can be worn many ways. 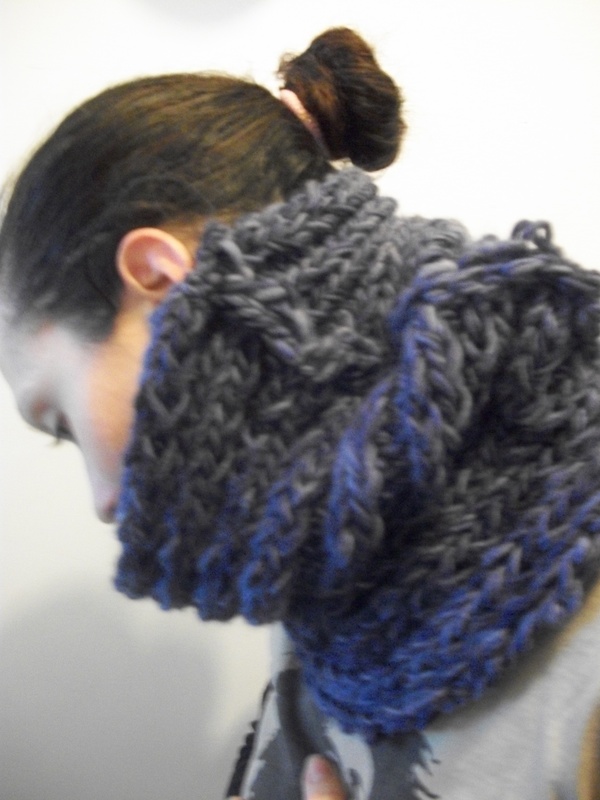 You can wrap it around as a shawl or wrap. 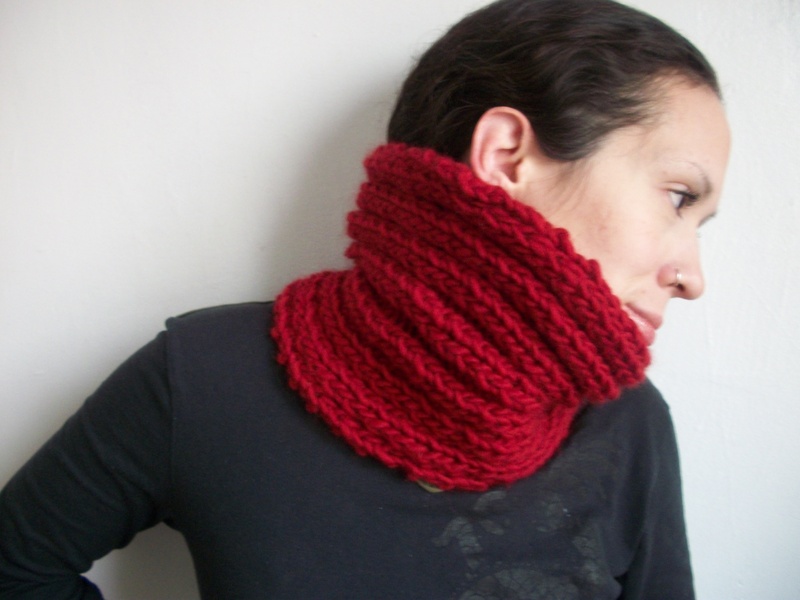 You can wear it as a scarf, around the neck. 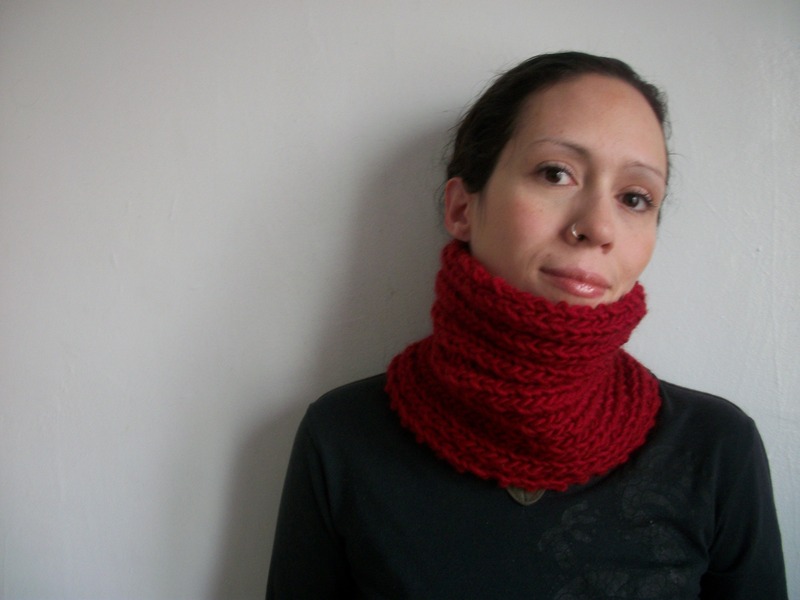 You can wear it as a cowl. Continue until piece measures 50″, then cast off. That’s it! You are finito. Easy right? Even a beginner can knit this up. I hope you like this new one. A beautiful and simple lace pattern gives a simple concept a new spin. 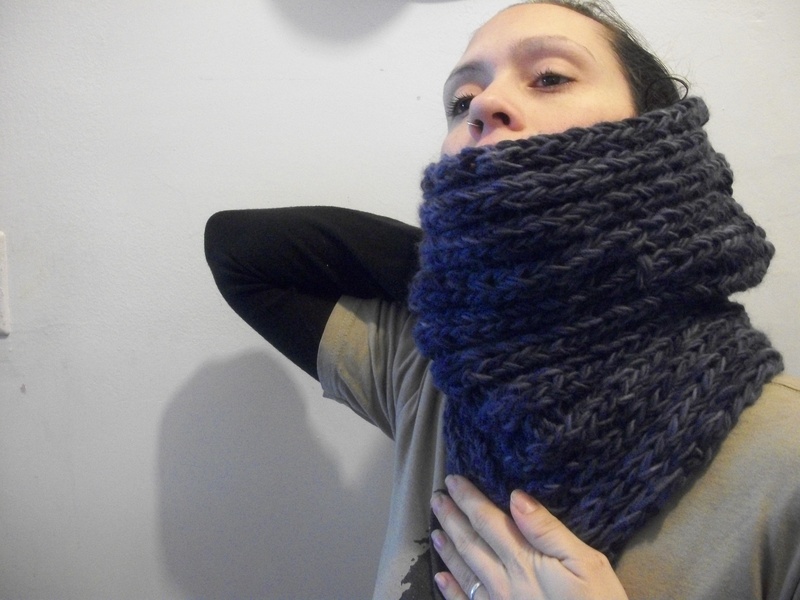 It’s knitted and sewn up together, to make it a cowl. 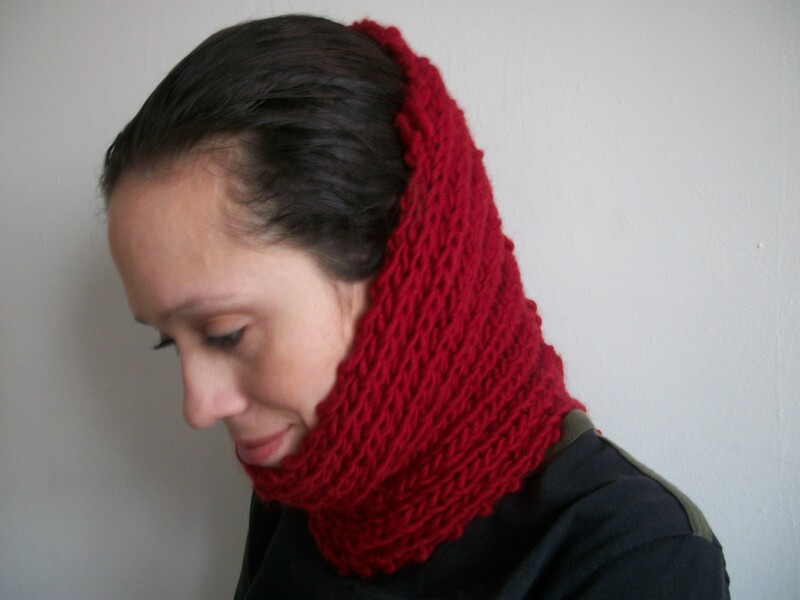 But it’s more than a cowl, since this baby can go over your head, to cover your ears when the cold wind really blows hard. This is knit with a beautifully soft angora & merino blend. Amazing. It feels so yummy to knit with. This baby is actually for a swap that I’m in, with the Park Slope Knitting Circle. It’s so cute, I don’t want to give it up! But alas, I must. I’ll make more. I have plenty of yarn here at home. Here’s a pattern for you, just because I’m cool like that. Cast on about 27 or so sts. Repeat rows 5 & 6 three times, then start over from row 1. Just keep going, until piece measures about 42 or so inches. Sew up the two ends, and there you go! It’s done! I used a beautiful yarn called “Sublime” Angora Merino wool, and it took up about 1 and a half skeins of it. I used size 7.00 mm circular needles, but you can use straights. Also, gauge isn’t important, since this is a lovely breathable lace.